President Donald Trump met with former Secretary of State Henry Kissinger, surprising reporters as the meeting was not on the schedule for Wednesday. 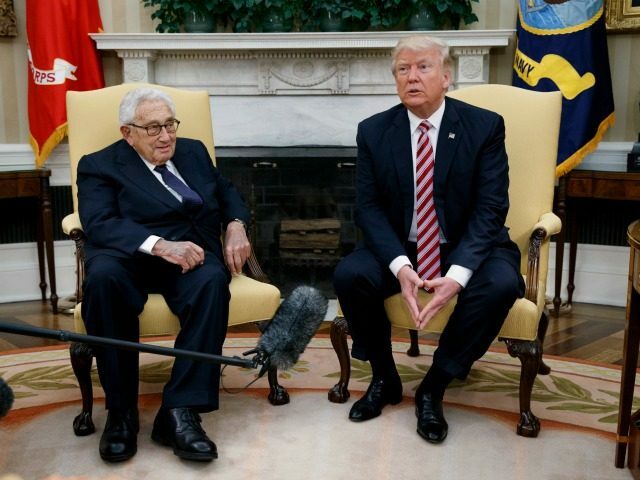 Both Trump and Kissinger remained seated as reporters were allowed into the Oval Office to photograph the meeting. Trump added that he also discussed Russia with the former Secretary of State who served under former president Richard Nixon and former president Gerald Ford. Kissinger signed a letter in December 2015 defending the entry of refugees into the United States, urging congress to continue welcoming them into the country. “Categorically refusing to take them only feeds the narrative of ISIS that there is a war between Islam and the West, that Muslims are not welcome in the United States and Europe, and that the ISIS caliphate is their true home,” the letter read. It was also signed by Former Secretary of State George Shultz and Madeleine Albright and Retired Gen. David Petraeus.